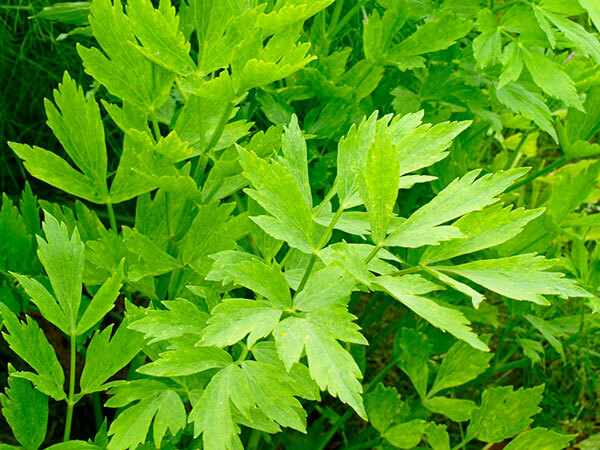 Formerly Lovage was used for a variety of culinary purposes, but now its use is restricted almost wholly to confectionery, the young stems being treated like those of Angelica, to which, however, it is inferior, as its stems are not so stout nor so succulent. The leafstalks and stem bases were formerly blanched like celery, but as a vegetable it has fallen into disuse. A herbal tea is made of the leaves, when previously dried, the decoction having a very agreeable odour. Lovage was much used as a drug plant in the fourteenth century, its medicinal reputation probably being greatly founded on its pleasing aromatic odour. It was never an official remedy, nor were any extravagant claims made, as with Angelica, for its efficacy in numberless complaints. The roots and fruit are aromatic and stimulant, and have diuretic and carminative action. In herbal medicine they are used in disorders of the stomach and feverish attacks, especially for cases of colic and flatulence in children, its qualities being similar to those of Angelica in expelling flatulence, exciting perspiration and opening obstructions. The leaves eaten as salad, or infused dry as a tea, used to be accounted a good emmenagogue. and the plants should be spaced quite 4 feet apart. ‘eye’ 2 inches or so below the level of the soil. ​This stout, umbelliferous plant has been thought to resemble to some degree our Garden Angelica, and it does very closely resemble the Spanish Angelica heterocarpa in foliage and perennial habit of growth. It has a thick and fleshy root, 5 or 6 inches long, shaped like a carrot, of a greyish-brown colour on the outside and whitish within. It has a strong aromatic smell and taste. The thick, erect hollow and channelled stems grow 3 or 4 feet or even more in height. The large, dark green radical leaves, on erect stalks, are divided into narrow wedge-like segments, and are not unlike those of a coarse-growing celery; their surface is shining, and when bruised they give out an aromatic odour, somewhat reminiscent both of Angelica and Celery. The stems divide towards the top to form opposite whorled branches, which in June and July bear umbels of yellow flowers, similar to those of Fennel or Parsnip, followed by small, extremely aromatic fruits, yellowish-brown in colour, elliptical in shape and curved, with three prominent winged ribs. The odour of the whole plant is very strong. Its taste is warm and aromatic, and it abounds with a yellowish, gummy, resinous juice. It is sometimes grown in gardens for its ornamental foliage, as well as for its pleasant odour, but it is not a striking enough plant to have claimed the attention of poets and painters, and no myths or legends are connected with it. The name of the genus, Ligusticum, is said to be derived from Liguria, where this species abounds.